I’ve always been a hunter and gatherer of old stuff, and the first “collection” I assembled while still in my early 20s was of nineteenth-century pearlware children’s plates, primarily ABC and nursery plates intended for instruction and edification: I had quite a few of Franklin’s Maxims, a few domestic scenes, animals, and lots of Robinson Crusoe: I still have the latter, one elephant plate, and a fortune-telling scene, but I sold off the rest a decade or so, along with all of my transferware. When I was hunting around for these little plates, I remember seeing some that were a bit political, and wondering: why would children care about free trade? 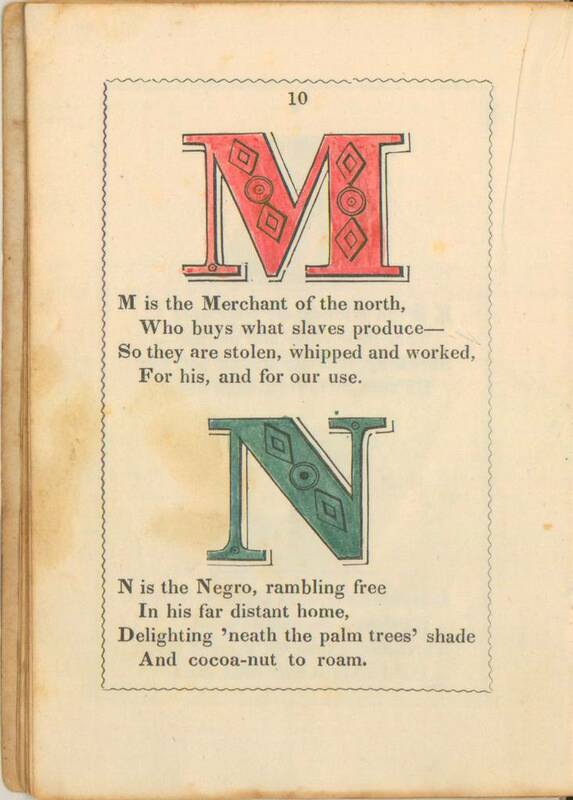 But slavery was a far more passionate and accessible topic, and quite a few abolitionist ABC plates appeared in the mid nineteenth-century, especially after the production of Uncle Tom’s Cabin. 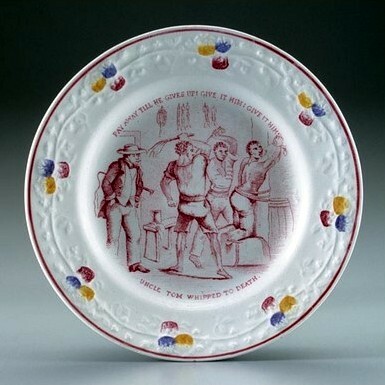 These plates were produced primarily in Britain for the northern American market, and the Staffordshire potteries had the dual motivation of meeting (and perhaps creating) demand in America while presenting themselves as morally superior to their cousins across the Atlantic: there is an amazing transfer-printed jug in the collection of the Winterthur Museum which advertises all the available patterns along with one scene in which showing “Britannia Protecting the Africans”. 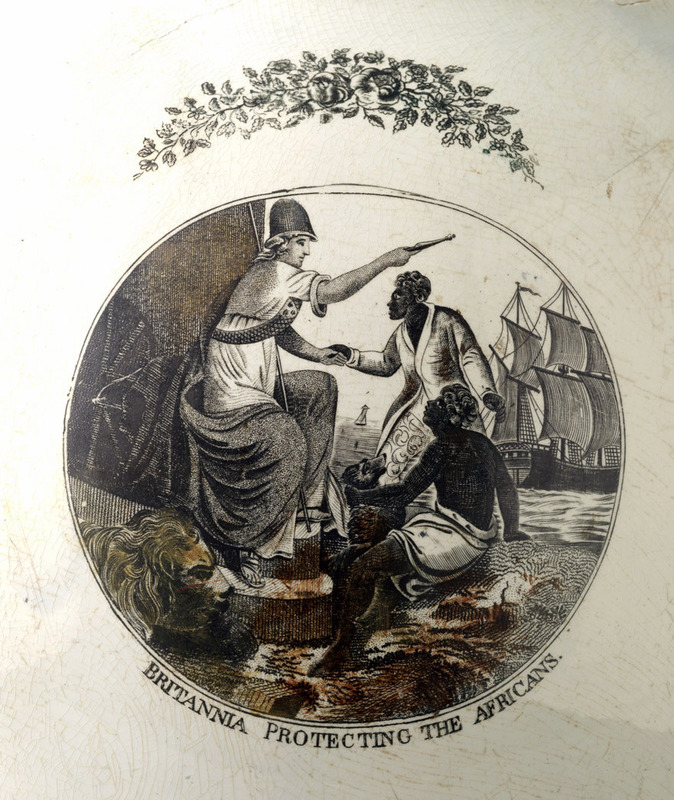 The British were so very clever at catering to both sides in the struggle over slavery in America: preaching to the North while buying cotton from the South! 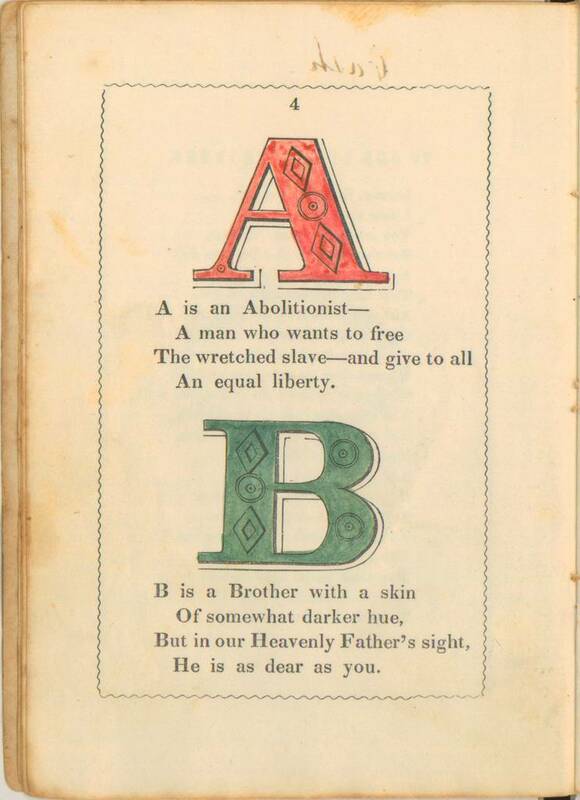 The Winterthur collection also contains an anti-slavery ABC plate based on the work of Mary Belson Elliot, “blending sound Christian principles with cheerful cultivation”, and a popular children’s mug first sold at the 1846 Philadelphia Anti-Slavery Fair, along with the wonderful Anti-Slavery Alphabet produced by the Townsend sisters. 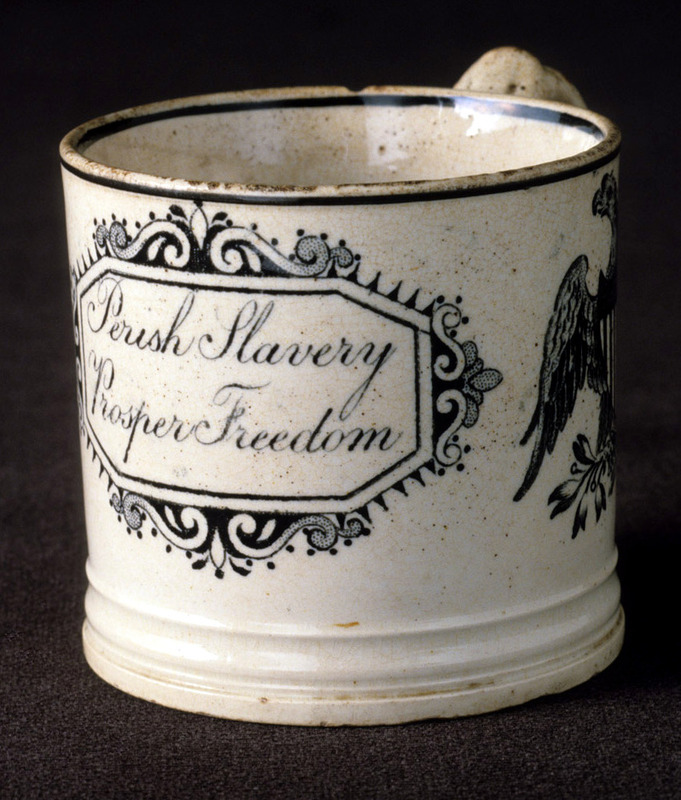 From the Winterthur Museum Collections: Staffordshire pearlware jug made by Christopher Whitehead, c. 1817-1819, ABC plate, c. 1800-1830, and child’s mug, c. 1795-1865; Pages from the Anti-Slavery Alphabet of Philadelphia sisters Hannah and Mary Townsend, 1846. 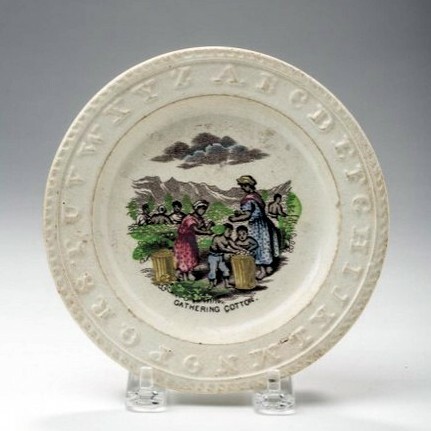 The particular plate that returned my attention to ABC plates in general and anti-slavery ABC products in particular is a lot in the upcoming Memorial Day Auction at Northeast Auctions: “Gathering Cotton”. 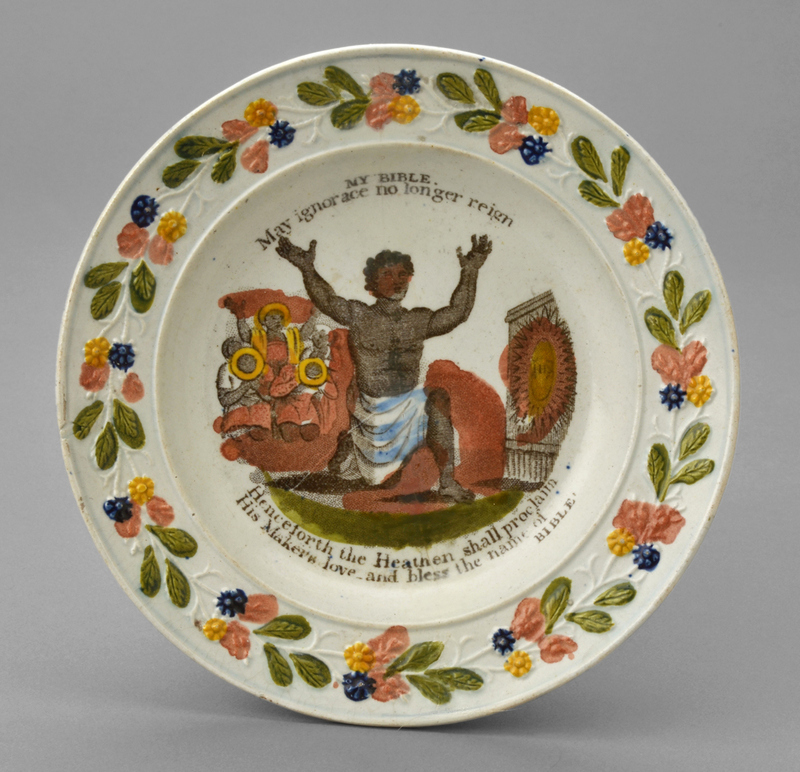 This is a Staffordshire plate as well, but produced later than the Winterthur pieces (between 1850 and 1865) and its meaning/purpose is far less straightforward: I can’t tell if it’s for or against slavery! 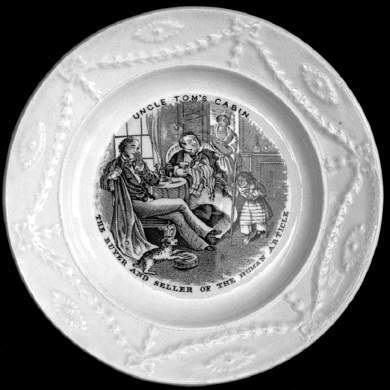 With children front and center, I assume it is anti-, but it projects a far less strident message than other plates that were produced at this time, primarily based on Uncle Tom’s Cabin, with scenes such as “The Buyer and Seller of the Human Article” and “Uncle Tom Whipped to Death” depicted. Once the Civil War began, the messaging of ABC plates became even more straightforward, with simple depictions of Union generals produced, of course, in Great Britain. “Gathering Cotton” and other mid-nineteenth century Staffordshire ABC plates, from the Harriet Beecher Stowe Center and the University of Wisconsin-Madison Decorative Arts Database, referenced in two great articles: Louise L. Stevenson’s “Virtue Displayed: the Tie-Ins of Uncle Tom’s Cabin” (available here), and Jill Weitzman Fenichell’s “Fragile Lessons: Ceramic and Porcelain Representations of Uncle Tom’s Cabin” (available here). 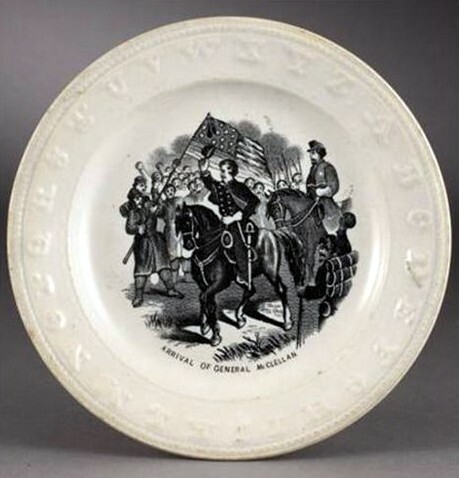 “The Arrival of General McClellan” Staffordshire ABC plate, Cowan’s Auctions. This entry was posted on Saturday, May 9th, 2015 at 11:04 am	and tagged with abolitionism, Antiques and Collectibles, Auctions, books, Decorative Arts, Pottery, Shopping, Slavery and posted in Culture, History. You can follow any responses to this entry through the RSS 2.0 feed. Thanks, Dawn. I appreciate your visits!